The key accused in the recent child sale case surrendered before the police here this afternoon. Delhi-based Sham Kumar also brought along the infant, whom he had reportedly "bought" from a helper of a cremation ground here for an amount of Rs 1.5 lakh. Even as the deadline for the deposition of regularisation charges and compounding fee with the local bodies concerned is drawing near, applications for only 900 out of several lakhs of houses in illegal colonies across the district have been received so far. The Bhargo Camp police has arrested two snatchers involved in a July 9 incident related to an SAS Nagar-based woman. Goods worth lakhs of rupees were gutted in a fire at a paint and chemical factory at Ghah Mandi today. Finally acting on the issue of the discharge of toxic, untreated, chromium-laden waste into the Kala Sanghian drain by the Leather Complex here, the Punjab Pollution Control Board (PPCB) today sealed 55 drums of nearly 35 tanneries here. A theft of copper goods worth several lakhs of rupees has been reported at a metal works factory near Lidran here. While the days of the nightmarish Garha outbreak are currently over, the lingering aftermath of the season of water-borne diseases continues to torment the district residents as well as the Health Department. Chandramuhkhi Chautala, the feisty Haryanvi cop, accompanied by her funny sidekicks Gopi and Billu, stepped into the city to render a slice of FIR humour to the city. On the completion of 1,000 episodes of their hit show, a visibly pleased cast shared some moments of their journey here today. A meeting of AIE (ETT Union) was held at the local Desh Bhagat Yadgaar Hall under the leadership of Punjab president Swarna Devi today. ETT teachers across the state were present on the occasion. Air Marshal SS Soman, Air Officer Commanding-in-Chief (AOC-in-C) of Western Air Command accompanied by his wife Rashmi Soman, president of Air Force Wives Welfare Association (Regional), Western Air Command, paid a two-day visit to Air Force Station at Adampur which concluded today. 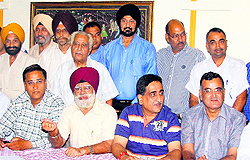 City businessmen have decided to restart their agitation on the issues of Value Added Tax (VAT) and e-trip against Parkash Singh Badal led SAD-BJP government for not implementing their demands accepted in July 30 meeting with Deputy CM Sukhbir Badal. The key accused in the recent child sale case surrendered before the police here this afternoon. Delhi-based Sham Kumar also brought along the infant, whom he had reportedly "bought" from a helper of a cremation ground here for an amount of Rs 1.5 lakh. The accused, who was booked under the Human Trafficking Act on Saturday last, was presented in the court of Manish Garg this evening. A woman constable came carrying the infant in her arms during the hearing. The mother of the infant also reached the court during the hearing pleading that his custody be given to her. The court conceded to her demand and the infant was handed over to her. The court ordered one-day police remand for Sham Kumar. The ACP (West) Ravinder Pal Singh Sandhu said the accused had now revealed that he had two children and he had taken the child for his brother Sanjay Kumar, who did not have any issue. "On being quizzed as to why did he then filed affidavits in his name and paid up the amount, he said he did that on his brother's behalf," Sandhu said. The police claims to have recovered Rs 1.16 lakh of the amount paid by Sham Kumar, while the rest of the amount is slated to be with the other accused, who are at large. Others accused in the case, who are yet to be apprehended, include ASI of the same police station Som Lal, two women Kulwant Kaur and Raj Rani and one Kashmir Singh, all of whom had shared the remaining amount received as extortion from the father of the child Dharam Singh. Sub-Inspector Subash Chander and ASI Bhupinder Singh are already under arrest in the extortion case. Pooja, receptionist at the nursing home, and Dharam Singh have been arrested on the charges of human trafficking. Tara Rani, midwife, is also on the run in the same case. Despite public notices issued in this regard, photographs of ministers and officials giving out NOCs to applicants appearing in media daily and a sustained campaign being held across the district by means of public address system and camps, the response has so far been feeble. There are officially 433 illegal colonies falling under the Jalandhar Development Authority (JDA) and 323 under the Municipal Corporation (MC). The number of unauthorised colonies falling under the municipal committees of Mehatpur, Kartarpur, Nakodar and other peripheral towns are not even on record. Even if there are just about an average of 100 houses falling in each colony, the number of applicants should have been in tens of lakhs. The government has even engaged Deputy Commissioners, Additional Deputy Commissioners and SDMs on the job asking them to closely monitor the collection of amount as regularisation charges and compounding fee. The fund-starved government has even initiated steps to make the deposition of amount convenient by making the process online and getting help desks set up in various offices, but to no avail. Meetings are being held almost every other day as the last date for the deposition of regularisation charges and compounding fee October 7 is drawing near. The ADC, Perneet Bhardwaj, today got a press release issued mentioning that FIRs would be lodged against those not regularising their properties. He has urged the residents to apply well in time and save themselves from harassment of applying close to the deadline. He held a meeting wherein officials of the MC, JDA and Deputy Director, Local Bodies, collectively reported that they had issued no-objection certificates (NOCs) to 425 of 900 applicants and the rest cases were being processed. He added that collection centres had been set up in the offices of Municipal Corporation, municipal committees, and Suwidha Centres of Jalandhar, Nakodar, Shahkot and Phillaur. The meeting was attended by SDM-I Iqbal Singh Sandhu, SDM-II Paramjit Singh, SDM (Phillaur) Jasvir Singh, SDM (Nakodar and Shahkot) Hardeep Singh Dhaliwal, GA to DC Sanjeev Sharma, Joint Commissioner, MC, Anupam Kler and Estate Officer, PUDA, Amarjit Singh Bains. The police has arrested Atul Suryavanshi, resident of Deol Nagar, and Sukhwinder Singh of New Kartar Nagar for snatching the purse of Suman Lata. A case was registered under Section 382 of the IPC on the complaint of the woman that two bikers had snatched her purse having Rs 5,000 and a mobile phone when she was going on a rickshaw. Her mobile phone has been recovered. The police has also impounded the bike. The ACP (West), RPS Sandhu said 105 gm of intoxicant powder was seized from Sukhwinder. Six fire tenders reached Narang Paints and Chemicals to extinguish fire. 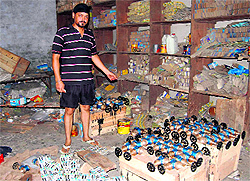 Subhash, owner of the factory, said the fire was noticed by his brother at 7 am when he was going to an adjoining factory. Minor blasts occurred on the premises owing to presence of chemical substances. The flames were doused after about two hours of effort. Officials of the PPCB found that only a common effluent treatment plant (CETP) of 5 MLD capacity was in operation, while another with 1.5 MLD capacity was not in operation. As per the calculation of the officials, the installed capacity of tanneries at the Leather Complex is about 8.8 MLD. Even if some of the units were operating below capacity, the treatment capacity was clearly far much lower they ascertained. The officials said ever since there had been restrictions against Kanpur-based tanners for discharging their pollutants into the Ganga, they had been getting part of their leather processing work done from their counterparts in Jalandhar, owing to which the discharge of pollutants into the Kala Sanghian drain had further increased. Senior Environmental Engineer, Punjab Pollution Control Board, Zonal office, Jalandhar, SP Garg, said the drums had been sealed as per the directions under Section 33-A of the Water (Prevention and Control of Pollution) Act 1974. He informed that the capacity of CETP of 5 MLD was being enhanced to 6 MLD, which would be operational by the end of the next month. The Punjab Effluent Treatment Society (PETS) is also learnt to have recommissioned its 1.5 MLD CETP. Garg said the seal of the drums would be removed only when the extra treatment capacity was available. "The new units will also be allowed only if further treatment capacity is be available after successful functioning of both the CETPs," he added. Environmentalist and member of the PPCB Balbir Singh Seechewal has held several protests at the site and even blocked the untreated discharge into the drain using his own workforce by creating bandhs. Balbir Singh Seechewal has time and again raised the issue of flow of carcinogenic elements into the drain, which he has said was wreaking havoc with the lives of local populace of 70 villagers causing skin ailments, breathing diseases and renal problems. While the thieves covered the CCTV cameras installed on the premises to protect themselves from being identified, they perhaps could not see some cameras installed outside which recorded their activity. The policemen has taken the recording. The SHO of the Division No 1 police station, Balbir Singh, said the thieves seemed to be some migrant labourers. “They clearly are not employees of the factory as the owners have not been able to identify them. The footage shows that there are about four to five men who filled sacks with stuff and made five rounds in and out of the factory. As per the estimates, one sack fills up about 30 kg of the stuff worth Rs 10,000,” he added. The SHO said a case had been registered on the complaint of factory owner Parduman Singh and hunt was on to nab the accused. The factory had wild growth all around. There were reportedly two families living in the vicinity of factory, who had dogs too, but no alarm was raised. Despite fogging by the MC and spraying undertaken by the health authorities, there seems to be no let up in the number of dengue cases in the district so far. Presently, the number of dengue patients in the district is 12 with one more patient testing positive from Kapurthala, the number of positive patients reached 13 today. Barring the 13 patients who have tested positive so far, there are also four suspected dengue patients whose preliminary tests have all been positive but their final status shall only be known after the final Mac-Elisa test. Meanwhile, patients suffering from fever and reduced platelet count also continue to pour in. In the male and female medical wards at the Civil Hospital, over 20 of the admitted patients were those suffering from fever, all of whom had reduced platelet count. So far patients of dengue have been reported from Bhagat Singh Colony, Grain Market, Maqsudan, Basti Bawa Khel, Qadian Mal, Sangowal, Jwala Nagar and Jamsher among other places. While the threat looms only until the onset of winters, dengue can be kept at bay only by avoiding stagnation of water in artificial and/or natural pockets and containers in this crucial season. The dengue mosquito breeds on stagnating water pockets formed in crevasses, objects or plant recesses. The threat can be posed by most mundane of objects like water accumulating in a garden pot or a tree hole. But the health authorities say the prime threat in the district is posed by artificial containers. Chandramuhkhi Chautala, the feisty Haryanvi cop, accompanied by her funny sidekicks Gopi and Billu, stepped into the city to render a slice of FIR humour to the city. On the completion of 1,000 episodes of their hit show, a visibly pleased cast shared some moments of their journey here today. While Chandramukhi Chautala (Kavita Kaushik) and Gopi (Gopi Bhalla) have previously also been a part of FIR’s cast, this season will see the entry of Billu (Vipul Roy). FIR’s freshest main lead Vipul Roy, responding to Dabang comparisons said, “Chulbul Pandey is a larger than life cop and he is a UP-based cop in a humorous setting so the two are very different.” He said he felt great to be hitting the screen though a successful platform like FIR. Swarana Devi said ETT teachers had come to Punjab schools across the state from 2007 as volunteers. While no TET (Teachers Eligibility Test) was applied on ETT teachers on the occasion. She demanded from the Punjab CM Parkash Singh Badal that as per the teachers’ experience, they should be sent to schools soon. If the government does not agree to their demands, then they will take to the path of struggle, she said. She said the government should stick to its promises made to the teachers after their clearance of ETT courses, failing which teachers will work on holding protests. Swarna Devi, Jaskaran Singh, Karnail Singh Ropar, Kuldeep Kaur, Gurbaksh Kaur, among others, were present on the occasion. They were received by Air Commodore SK Mohlah, Air Officer Commanding Air Force Station Adampur and Nandhana S Mohlah, president AFWWA Adampur. On arrival, AOC-in-C visited various work places at the station and interacted with the personnel, including civilian employees of the station. In his address he exhorted to the personnel to feel pride of their uniform. Rashmi Soman attended various functions of AFWWA. Air Marshal SS Soman is a graduate of the National Defence Academy, Pune. He was commissioned in the Flying Branch in December 1976 and has more than 3,400 hours of flying on fighter aircraft to his credit. His field assignments include Commanding Officer of a Fighter Squadron, Chief Flying Instructor at the Flying Instructors School, and Chief Operations Officer at Air Force Station Srinagar during Operation Parakram and Air Officer Commanding Pathankot. His senior assignments include Air Defence Commander at Headquarters Western Air Command, and as Senior Air Staff Officer at Headquarters Western Air Command and Headquarters South Western Air Command. Holding a meeting under the aegis of the Industrial and Traders Joint Action Committee (JAC) at Dolphin hotel here on Friday, city businessmen gave a fortnight ultimatum to Badal government to implement their already accepted demands by October 5 failing which they would be left with no option but to restart their agitation after the deadline. State president of Vayapar Sena Ravindra Dhir said Sukhbir agreed on July 30 in principle to implement e-trip only for inter-state transactions for the businessmen and it would be imposed on transporters for inter-district and district-level transactions but the businessmen were not provided any relief from e-trip even in inter-district transactions in Punjab itself. “There is ambiguity in the policy on e-trip in the state as some officials say it will be implemented for businessmen in inter-district transactions, whereas chief parliamentary secretary (CPS) for excise and taxation Sarup Chand Singla during his visit to Jalandhar stated that it would also be applicable for district-level transactions for businessmen.” he said. Secondly, Badal government also ignored imposing of only two per cent VAT on invoice, he said, adding that it was agreed in the meeting to withdraw VAT on notebooks but that was also not implemented till date.